Photography has come a long way from the first photographs. Photography has now progressed past the need for film and chemicals to the realm of sd cards and computer processing. The first photograph was taken by the Frenchman, Joseph Nicephore Niépce. Joseph Nicephore Niépce was fascinated with lithography but he did not have a steady drawing hand. His son instead made the images for his experiments. In 1814, his son was drafted into the army and Niépce was left with no one to make his illustrations. He began looking for other ways to make images. Niépce experimented with using silver salts and concocted his own light-sensitive coating. He used this on stones and glass plates. He was able to use this process to copy engravings. He is said to have created the first photogravure etching in 1822. The engraving of Pope Pius VII was his first successful attempt. Unfortunately, later when he tried to duplicate the image the first engraving was destroyed. In 1826, Niépce perfected Heliography. This new photographic process used bitumen as a coating on pewter plates. The bitumen was hardened by the light. After the image was taken, a mixture of petroleum and lavender oil were used to wash away the bitumen that had not been exposed to the light. The end result was a one-of-a-kind photograph on a pewter plate. 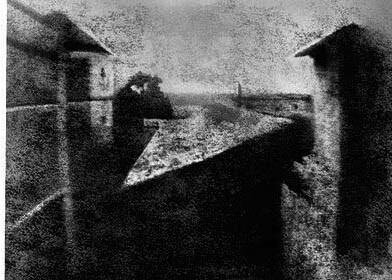 The first known photograph using this process was taken by Niépce in the summer on 1826. A simple camera with a pewter plate was set up in the window of his upper-story studio. An eight-hour exposure rendered a very soft focus image of a few buildings and a tree. Because of the very long exposure, the sun appears to be shining from both sides of the picture. Niépce attempted to interest the English Royal Society in his new invention. His refusal to reveal his method for making the image meant no one wanted to pursue his new photography methods. Niépce continue to work on the method himself and became increasingly frustrated with his inability to shorten the exposure times of his plates. In 1829, he formed a partnership with Louis-Jacques-Mandé Daguerre to continue to work on Heliography. 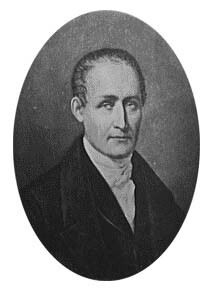 Niépce passed away in 1833 without seeing any new advancements in the photography. In 1837, Daguerre would invent the first practical method of photography building on the original ideas on Niépce. ← Invention Geek – State Patents?